I was lucky enough to talk to the CEO of Kore Mining, Adrian Rothwell, to get a detailed look at his company. We talked about the exploration and development assets that Kore Mining currently holds, the potential for a new bull run in gold, and what plans Kore Mining has for the next 12 months. Hi Adrian, welcome to The Next Bull Market Move. Let’s begin with an overview of your career to date. You are currently the director of Fireweed Zinc and you were a former executive at Goldcorp, and now you are the President, CEO & Executive Director of Kore Mining. So why start a brand new gold company? Does your previous experience tell you that now is the time to start a new gold company? Hello Kerem. Thank you for the opportunity to talk about Kore. I have been involved in the junior mining sector since 1995 and, after having seen a number of cycles in the market, I believe that we are at the early stages of another bull-run in gold. After such a long recessionary cycle in gold and resulting lack of speculative capital, I really believe now is the time to invest in the gold sector – I am a bit of a contrarian at heart. Why start a brand new company? While market timing and value opportunities available were both considerations, it was also the right time in my personal career to share what I had learned over the past two-plus decades. Give us an overview of the rest of your team at Kore Mining. ﻿I am lucky to have such an experienced team at Kore. Firstly, at the Board level, we have a breadth of experience from exploration through to production, capital markets and management of larger development and production companies. In creating this Board, we really looked at the trajectory of the Company going forward to ensure that we had the experience to cover “what comes next” in permitting, development, strategic transactions and production. As any CEO of a small company can attest, mentors can be hard to find – but I think we have cultivated this successfully at Kore. Brendan Cahill is President and CEO of Excellon Resources, a silver producer in Mexico, and is represented on a number of Boards. Don MacDonald is current CEO of NorZinc Ltd, which is in development of the Prairie Creek Zn-Pb-Ag mine in Canada, and was formerly Interim CEO of KGHM International (Quadra FNX). Harry Pokrandt has extensive capital markets experience as the managing director of Orion Securities (now Macquarie Capital Markets) and, more recently, as director of a number of junior exploration and development companies – Hive Blockchain, Sandspring Resources and Lithium X. James Hynes (Geological Engineer) is the technical COO of the company. He previously worked as a VP Exploration in the aggregate business, which serves us well on the Imperial project, which contains a significant amount of aggregates that could provide a solution (partly) to the State’s predicted aggregate deficit. Let’s talk about the properties you have and for investors who are taking a look at your company, it seems you have a mixture of two development projects and two exploration projects. Tell us about the exploration projects first at your Gold Creek and your FG projects which are based in British Columbia. I understand the FG project has already had $15 million spent on it and there is some porphyry style mineralization within it? The British Columbia projects were incumbent from our combination with Eureka Resources – and were part of the reason why we targeted the Company as our going public transaction. The combination was mutually beneficial, with our Californian development projects providing the prospect of permitting success and the BC and Yukon projects demonstrating strong discovery potential in an existing mining district. The FG Gold (formerly “Frasergold” project) had approximately $15m spent to date and ~50,000m of drilling. The project has had work dating back to the 1960s – first as a copper-porphyry project by AMAX, Rio Tinto and Noranda and then (since the early 1980s) as a gold opportunity by Eureka. It has a current resource of 376,000oz M&I and 634,900 Inferred in the “Main Zone” but this is not our current focus. Based upon the compilation of over 50 years of historic soils, geochemistry, geophysical and samples (including drilling outside of the Main Zone), we have compiled some fantastic opportunities that we will be testing over the coming year. We have recently commissioned a 1,000m drill program on one target and await results on this zone – called the“Nova Zone”. We also believe the Main Zone to hold expansion potential in the context of our compilation work and will release news on this project shortly. The Gold Creek project is in the same area as Barkervilles Cariboo Gold project, Spanish Mountain and the Mt Polley Mine. This project has the potential to host a large resource and we have outlined a strike of about 8.5km of targets based upon compilation of historic soils and geophysical anomalies, as well as drilling on the project in 2011 and 2017. 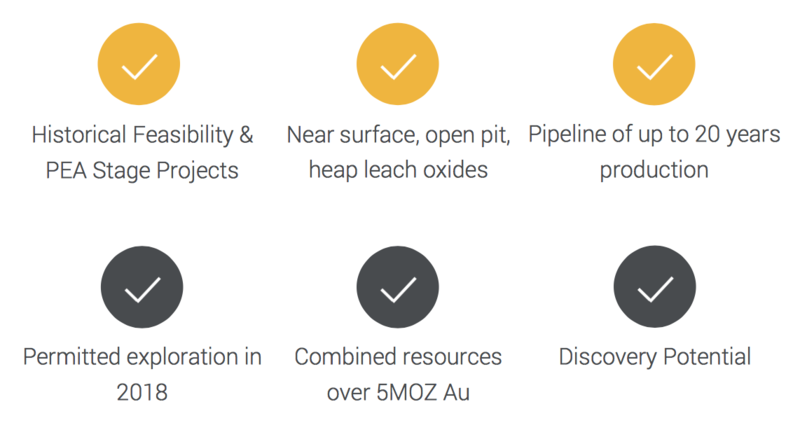 We have recently completed a 1,000m program on the project and are awaiting assays. I am personally very excited about the potential this project holds. It is very accessible (roads to site), lower elevation and in southern BC, which means a longer drilling season than other parts of the province. And lets move onto the development projects based in California, can you share some details at what stage of development they are at? The Imperial project is a quality development opportunity that deserves to be advanced to production. I saw positive changes in regulation in California and decided to focus there before acquiring two of the largest undeveloped gold opportunities in the state. The Imperial project has an historic feasibility study on it by Glamis Gold (now Goldcorp, who held the project prior to Kore’s acquisition). It has almost 200,000 feet of drilling and an existing completed permitting document (from 2000). Kore intends to first update background permitting studies before advancing permit submissions with Federal Authorities, whom are ultimately responsible for permitting of mining operations in this area – the project sits on BLM lands. We see this as an opportune time to advance such a project with the current Federal administration and a state and county that is looking for responsible economic development opportunities. From a technical perspective, Glamis was a reknowned operator and did a fantastic job of understanding all aspects of geology, engineering, and potential impacts of the project. We really are blessed with the work that has been performed to date, and we will commission an updated resource and economic study to communicate this to the market in 2019. What are your thoughts on the gold price and do you feel we are ready for another bull run in gold? I do think we are ready for another bull run in gold, but predicting timing is a tricky game. I believe that we are getting to the end of a long period of “kicking the can down the road” with respect to fixing some of the fundamental structural problems in western economies, particularly here in North America. I believe in gold as a form of currency – but one that is particularly good at protecting investors against loose government monetary policy, paper currency depreciation and inflation. Consumer spending will be extremely sensitive to any rise in interest rates, so I believe the remaining tools available for stimulus will ultimately be good for gold. I believe in making a quality company regardless of gold price, but positive movement will help! What plans do you have for Kore mining next year? I imagine a mixture of increasing your resources at your development projects combined with some exploration drilling? It is important that we continue behind the scenes to advance Imperial’s permitting, make submissions to federal and state agencies and engage with the local community. We will also update the resource on Imperial. At Long Valley, we will complete a low impact drill program to expand resources and (primarily) compile an updated PEA or PFS on the project. We are expecting to continue cost-effective exploration on both BC projects pending results to come in November/December this year. The Yukon is the wildcard, as our HAV project is on-trend with White Gold’s Vertigo discovery. And finally, why should investors take a look at Kore Mining? On a number of fronts, I believe that Kore is worth a long term investment. We have quality management aligned to shareholder interests, an experienced team, genuine leverage to gold price with cost effective exploration leading to discovery and back stopped by quality, and large development-stage projects in a more jurisdiction more mining friendly than 20 years ago. Moreover, permitting risk is well baked into the stock price of the company (as at November 5, 2018) with a competitive valuation of around $5/oz in the ground. To view disclaimer click here.